View More In Satellite TV Equipment. 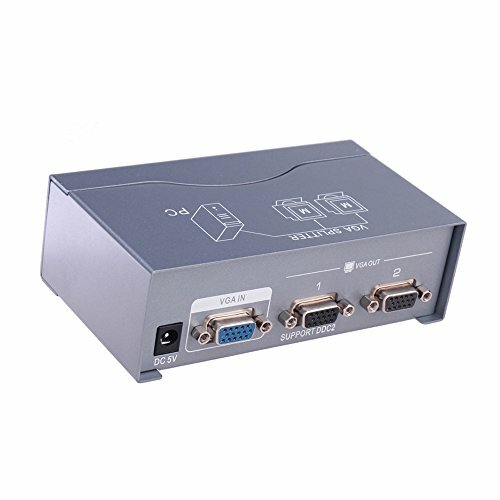 This 1 in 2 out VGA video splitter is a great choice for watching the same video on both of monitors, and its output image quality can be the same quality as the original signal. It copies and repeats one single signal, then sends it to two monitors rather than just passively splits it like cheap splitter adapter cable does, so that it enables you to display the same image on dual screens with the same quality signals as the original signals. It has the ability to extend operating distance up to 130ft, while your normal VGA card over a standard VGA cable can send clear signal approximately 25 feet only. This small but powerful box enables you to set up your far side displays easily. 1- It doesn't support extended desktop display applications, is not for viewing different images on each of monitors. 2 - Only output port 1 with "SUPPORT DDC2" label have DDC 2 function, which means that the other output ports take their cues from the port 1. If you plug a DDC compatible monitor into the port 1, all other monitors must be able to support the highest resolution of the monitor connected to port 1 (you can set up all the output monitor's resolution as the same). If you have any questions about this product by DTech, contact us by completing and submitting the form below. If you are looking for a specif part number, please include it with your message.